Collect as many cherries as you can before time runs out! Learn the basic requirements to build a functional game! Go to the MakeCode Arcade editor and select New Project to begin creating a new game. Once the editor loads, you will see a green ||loops:on start|| block already placed in the editor Workspace. We want the game to start with a Title Screen to let the player know what game they are playing. To do that, we go to ||game:Game|| in the Toolbox and under the Prompt category, drag a ||game:splash|| block into the ||loops:on start|| block. Give your game a title and put in as the text for the ||game:splash|| block. To set the background, click on ||scene:Scene|| in the Toolbox and drag the ||scene:set tile map to|| block into the ||loops:on start|| block. Go ahead and click the gray box and draw whatever you want the background to look like. Our next step is to create a movable character. To do this, go to ||sprites:Sprites|| in the Toolbox under the Create category and drag a ||sprites:set agent to|| block into ||loops:on start|. Next, draw what you want the agent to look like. Click the square grey box inside the ||sprites:set agent to|| block. A paint editor will pop up and this is where you will draw what you want your player to look like. OK, We’ve created our player! To move the player, click ||controller:Controller|| in the Toolbox and drag out a ||controller:control sprite|| block into the |||loops:on start|| block. Make sure the variable selected is agent. Then go to ||scene:Scene|| and under the Camera category, drag the ||scene:camera follow sprite|| block into the ||loops:on start|| block. Make sure the variable selected is agent. We do this so that when the player moves around the map, they will remain at the center of the screen. To make the player move faster, set the vx and vy to 150. Now we are able to move our player! In the simulator, test out the movement of the player. We want cherries to appear randomly on the screen every half a second. In order to do this, go into ||game:Game|| in the Toolbox and drag out the ||game:on game update every|| block onto the editor. Next we will define what a cherry is by going to ||sprites:Sprites|| and dragging out the ||sprites:set agent to|| block inside the ||game:on game update every|| block. Click the drop down and change agent to item. Click the gray square box to draw what you want your item to look like. Then click the drop down that says Player and click Add a new kind.... Name your kind Item. To spawn cherries on the screen, we need to make a random x and y coordinate. Go to the ||sprites:Sprites|| tab and drag the ||sprites:set agent position to|| inside the ||sprites:on game update every|| block. Change agent to item. 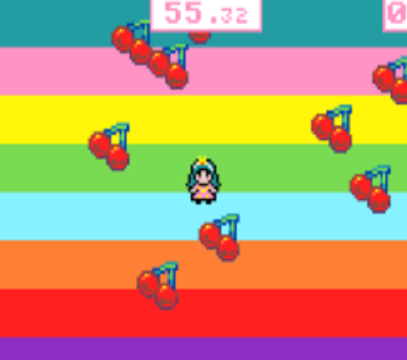 To make the cherry spawn randomly on the map, go to the ||math:Math|| tab and drag one ||math:pick random|| block into the x-value of the ||sprites:set item position to|| and another into the y-value. Change the values for the first ||math:pick random|| block to 0 and 160. Change the values for the second ||math:pick random|| block to 0 and 120. We need to keep track of how long the game will last. To do this, go to ||info:Info|| and drag the ||info:start countdown|| into the ||loops:on start|| block. Click on the 0 and change it to 60 so that the game will end after 60 seconds. The next part is to keep track of the score. Go to ||info:Info|| and drag the ||info:set score to|| into the ||loops:on start|| block. Leave the value at 0 since the player doesn’t have any points at the beginning of the game. We will add to the score in Part Six: Picking Up Cherries. The game simulator will automatically show the timer and score at the top of the screen. The last task is to let our player to actually collect cherries. Go to ||sprites:Sprites|| and under the Overlaps category, drag out ||sprites:on sprite of kind Player overlaps||. Next, in the ||variables:Variables|| tab, drag the item variable onto the otherSprite variable to replace it. Also, drag out the agent variable and drop it onto the sprite variable. Then go to the second Player drop down and select Item. To change the score when the cherry is touched, go to the ||info:Info|| tab and drag the ||info:change score by|| block into the ||sprites:on agent of kind Player overlaps|| block. Leave the value at 1. To remove the cherry that the player picks up, go to ||sprites:Sprites|| in the Toolbox and under Lifecycle, drag the ||sprites:destroy|| block into the ||sprites:on agent of kind Player overlaps|| block. Change agent to item. And now we have a fully functioning game!